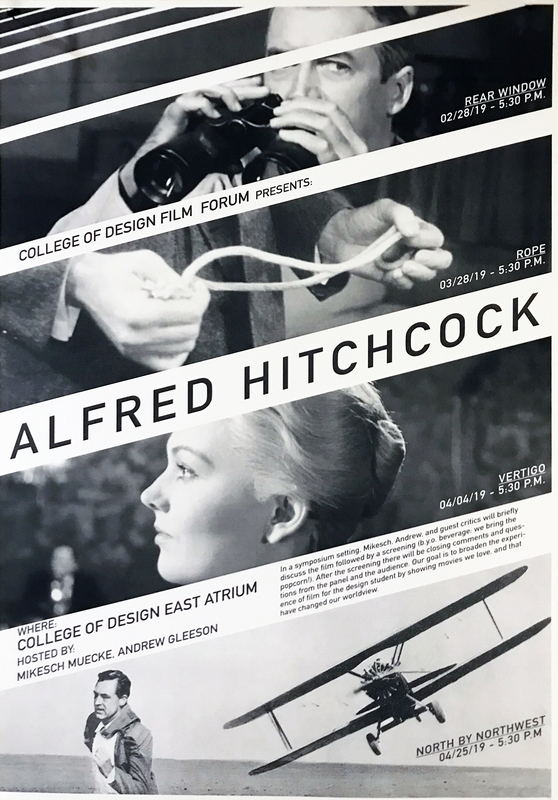 The Department of Architecture presents the College of Design Film Forum on Alfred Hitchcock. In a symposium setting, architecture faculty Mikesch Muecke and Andrew Gleeson, together with guest critics, will briefly discuss the evening’s film, followed by a screening. This will be followed by closing comments and time for questions. The goal is to broaden the experience of film for the design student by showing movies the faculty members love and that have changed their world view. Tonight’s movie is Vertigo, starring James Stewart, Kim Novak and Barbara Bel Geddes. All movies are shown in the north end of the Lightfoot Forum.